This Beginner Pilates DVD is a great place to start if you are new to Pilates or have back and joint issues that you are concerned about. I developed this Healthy Back and Joint Beginner Pilates Workout DVD specifically for new students and older adults who are looking for safe exercises to strengthen the muscles that support the back and joints while increasing your flexibility at the same time. This Beginner Pilates DVD is based on years of teaching classes to an older adult population and through trial and error and science based research I have put together this beginner Pilates workout video. I believe it can benefit most anyone who may have a health condition and are concerned about starting an exercise program. My hope for you, and Joseph Pilates had the same knowledge and hope that you will feel a difference after a couple of lessons, see a difference after 10 lessons, and feel like you have a whole new body and awareness of it in 20 lessons. This Pilates Beginner Workout DVD has a beautiful sunset golf course setting with a well balanced 3 part system to the workout. 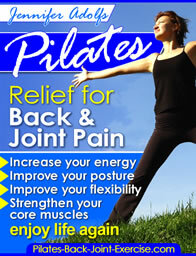 Click here to get your Pilates DVD for Healthy Back and Joints at a low price! You will learn how to BREATHE in an upright posture learning the importance of neutral spine to execute the movements safely and effectively. Find out more about abdominal breathing exercises here. You will also learn the importance of the “core”, “powerhouse”, or “girdle” of strength around your mid-section. Learning how to find and work in NEUTRAL SPINE and how to activate the abdominal musculature is most important for stabilizing the body before executing movements. This allows for more flowing and efficient movement patterns in the extremities of the arms and legs such as the Pilates Leg Circles below. You will learn the Fundamental Movements of Pilates. This is absolutely necessary in executing the exercises correctly and getting the most out of your workout. There are variations and modifications to these Pilates exercises so that you are able to modify positions for certain health conditions. You can find these beginner Pilates DVD exercises in my newly revised Pilates Ebook here as well. Pilates exercises have been proven to be effective in the rehabilitation of weak muscles and tight joints. Experience this Beginner Pilates DVD and notice how it can make everyday tasks easier, see how it can transform your body, especially your posture, and feel a brand new stronger, leaner, and more confident body. This section of the Pilates beginner workout DVD begins your CLASSIC PILATES MAT WORKOUT. You now have the knowledge to choose the modifications or variations suitable for your fitness level or health condition. These exercises really strengthen the abdominal muscles or core musculature of the body while lengthening the muscles of the whole body. The low number and quality of the repetitions of each exercise make them flow smoothly, with less strain, resulting in an energized state of being. If you have taken Pilates classes before that have left you feeling intimidated by the overzealous instructor and with no modifications for certain health conditions then this is the Best Pilates Video for you! Get your Beginner Pilates DVD Now for only $11.95!